In loving memory of a wonderful man. Passed away peacefully in Kellerberrin Hospital on the 22.03.2019. Forever Loved. Gwen, Joyce, Anne, Sue, Jim and families. 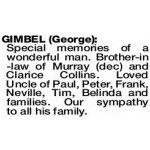 A Graveside Funeral Service for the late Mr George Gimbel of Quairading will be held at the QUAIRADING Cemetery on FRIDAY (29.3.2019) at 11.00am. 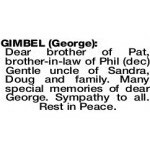 Dear brother of Pat, brother-in-law of Phil (dec) Gentle uncle of Sandra, Doug and family. Many special memories of dear George. Sympathy to all. Rest in Peace. Special memories of a wonderful man. Brother-in -law of Murray (dec) and Clarice Collins. 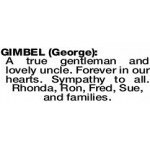 Loved Uncle of Paul, Peter, Frank, Neville, Tim, Belinda and families. Our sympathy to all his family. 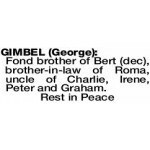 Fond brother of Bert (dec), brother-in-law of Roma, uncle of Charlie, Irene, Peter and Graham. A true gentleman and lovely uncle. Forever in our hearts. Sympathy to all. Rhonda, Ron, Fred, Sue, and families. Loving memories of a good man. 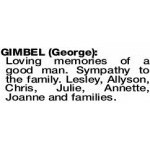 Sympathy to the family. Lesley, Allyson, Chris, Julie, Annette, Joanne and families.